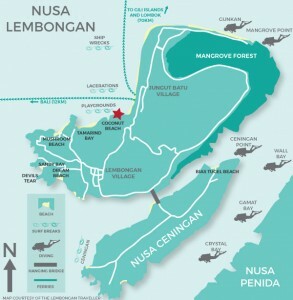 Aqua Nusa offers luxury private villa accommodation in the most desirable location on Nusa Lembongan. Overlooking Lembongan’s beautiful surf breaks, Aqua Nusa’s villa offerings are positioned in the most sought after location on Nusa Lembongan on the hill in the main village of Jungut Batu. The location offers incredible panoramic views of the Island’s crystal clear waters. Our villas are conveniently located within walking distance to many of Nusa Lembongan’s best venues on the hill in Jungut Batu, with spectacular views to be enjoyed along the boardwalk, providing the options for guests to dine out and explore or enjoy a romantic night in. Also situated within walking distance are beautiful beaches and guests can explore our magical surroundings or take it in from the privacy of their own balcony. The island offers all sorts of water activities which aare all within walking distance – just head down Jungut Batu Beach or Coconuts beach – for swimming, snorkeling and stand up paddle boarding. Directly out the front of Aqua Nusa villas are two world class surf breaks – Playgrounds and Lacerations. 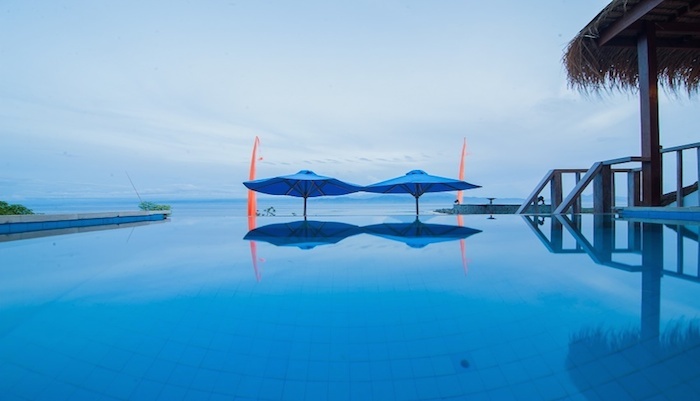 Guests of Aqua Nusa’s also receive complementary access to Nusa Lembongan’s premier beach lounge, Ohana’s with complimentary transport to and from the venue. Ohana’s is the perfect place to relax by the beach during the day with beachfront daybeds and infinity pool. 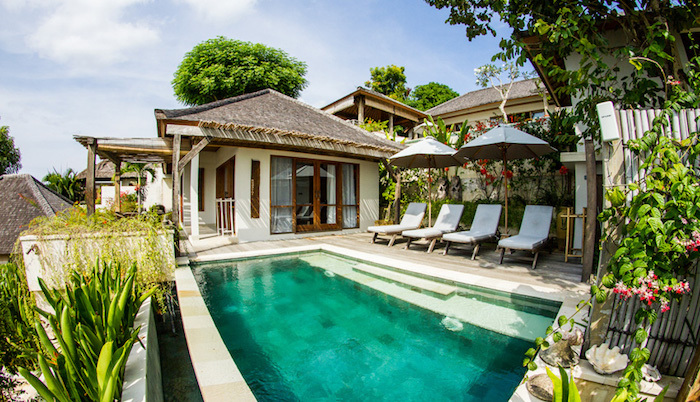 Villa Bunga is our largest villa set on 265m2 block amongst traditional Balinese style gardens. The villa features 3-bedrooms each with private marble ensuites as well as separate powder room by the private pool. Situated on the Jungut Batu Hill in Nusa Lembongan this large villa is brilliantly located yet designed as the perfect private retreat for couples or small groups staying on the island. IT is located close to the bars and restaurants along the waterfront. ​The villa has plenty of space; an open plan dining area, TV room and kitchen, equipped with a full-sized fridge, gas cooktop, microwave and all necessary utensils. The secluded balcony features a beautiful day bed which is the perfect place for relaxing. 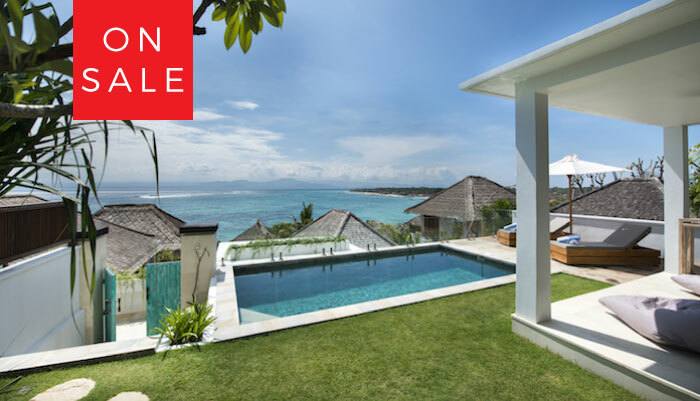 Villa Bunga is the perfect villa for families and groups looking for a large villa in Lembongan’s most desirable location with a mid-range price. Perfect for couples that want some extra space or groups of up to 6-people. This stunning one bedroom private retreat is situated on the hill in Lembongan and offers breathtaking panoramic views of the ocean and Mount Agung.​ This is a spectacular apartment for couples on a romantic getaway. The villa features a large bedroom which expands to the open plan living area and large balcony with a private infinity pool as the centerpiece for enjoying the incredible views. With your own marble kitchen and large bathroom, plus a separate powder room, the villa is the perfect escape. Located a short walk away from restaurants and bars, you will find that this villa is extremely convenient should you choose to dine out or if you would prefer a romantic evening in the villa then simply order takeaway from on the many options. This brand new one bedroom villa is situated at the very top of the hill in Lembongan on our upper level. This beautifully appointed 1- bedroom private retreat, offers guests exceptional views of the island and surrounding area; proving the best views Aqua Nusa has to offer. The villa features a large bedroom and ensuite expanding to the open plan living area and large blancony complete with plunge pool and outdoor lounges offering incredible views of Jungut Batu. The perfect getaway for a beautiful romantic escape. This brand new one bedroom villa is situated at the very top of the hill in Lembongan on our lower level. This beautifully appointed 1- bedroom private retreat, offers guests exceptional views of the island and surrounding area. The villa features a large ensuite with marble finishings and a separate powder room off the living space. 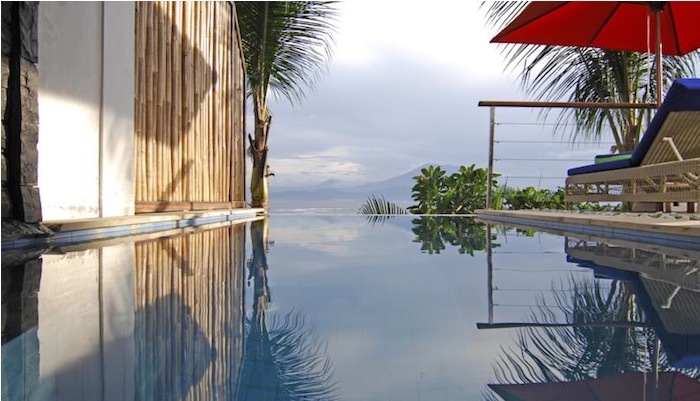 This villa is perfect getaway for a beautiful romantic escape. With the best views Aqua Nusa has to offer, this premier two bedroom villa occupying 135m2 is situated at the very top of hill in Lembongan. The villa is a beautifully appointed two bedroom, two bathroom private retreat with two large, spacious bedrooms each with their own private ensuites expanding onto the open plan living area and large balcony with plunge pool and breathtaking views of the island. From the master bedroom, your doors open to look directly to the pool and the panoramic island views beyond. Featuring a small self- contained kitchen and large lounge area, this villa offers ample space for groups to relax in the privacy and comfort of their own villa. Villa Tinggi is a brand new, luxury 135m2 two bedroom villa situated at the very top of hill in Lembongan. Two large, spacious bedrooms each with their own private ensuites expanding to an open plan living area, large expansive balcony and private plunge pool. This villa is perfect for families and small groups alike. The private plunge pool is situated on the balcony, offering beautiful of the island surroundings.